Eventually, I tried all sorts of pickups. 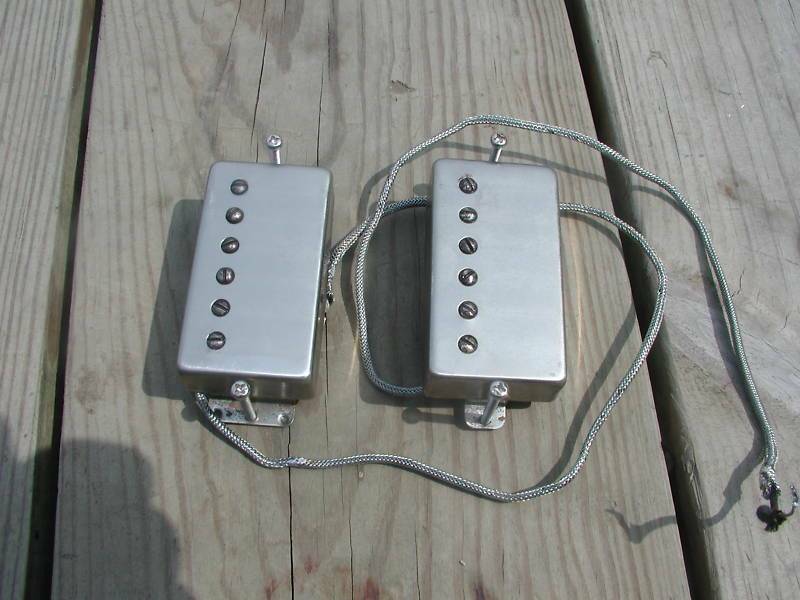 I started with professionally potted original Super 70s pickups with original Ibanez nickel pickup covers. These sounded terrible in all my amps and especially in my Rockstah Marshall. I ended up going with a new Dimarzio Super Distortion in the bridge position, just like I have in my '78 Frankenstein build...these pickups just work perfectly with Mod 5 amps for the first album sounds, so that's what I'm sticking with. I love the sound and I'll post a clip when I get my Rockstah Marshall out of the shop...which hopefully won't be too much longer! Eventually, I had my painters fill the cracks, sand it and paint it with pure white spray paint and then they buffed it with rubbing compound. 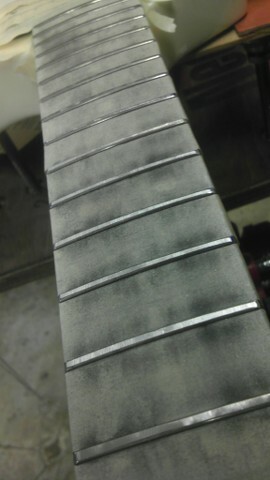 This is how Ed finished most of his guitars, including the original Frankenstein. 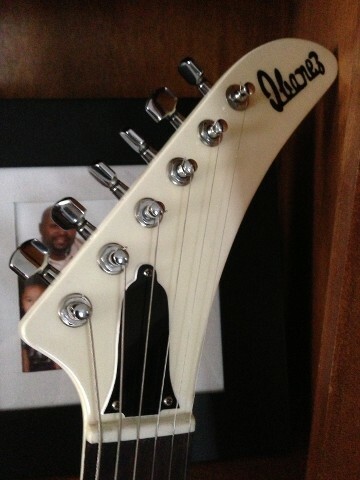 I had them add a black script Ibanez headstock logo exactly like the original Ibanez logos. Well almost exactly...Of course the original Ibanez Destroyers had a black headstock with a white logo, but since I painted the headstock white, I went with a black script logo. I think it looks great! Last edited by garbeaj; 08.18.14 at 03:11 PM. I ended up upgrading most of the other components. 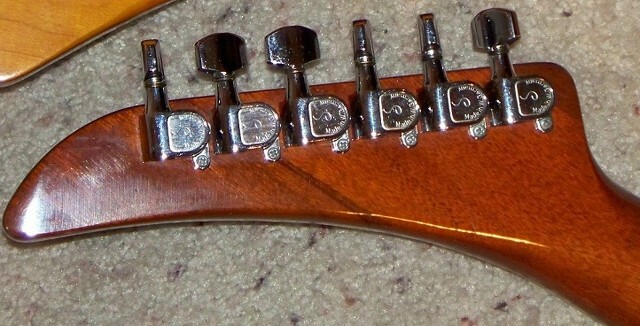 I started with original vintage "D" logo Schaller tuners...same as the ones Ed used on the original Frankenstein. 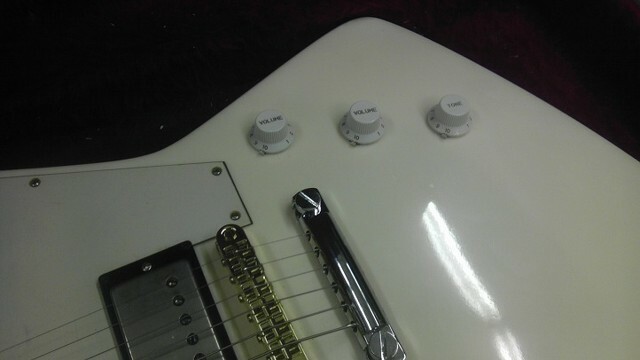 I also upgraded the jack using a Switchcraft input jack assembly with a chrome Gibson Explorer jackplate. The original Destroyers had horrible black plastic jackplates that broke easily. Then I got an RS Guitarworks vintage Gibson Explorer wiring kit with parts and wiring scheme that was period correct to vintage 1958 Gibson Explorers. 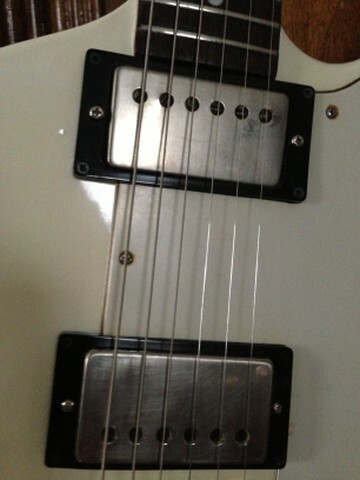 I changed it around a little by disconnecting the Tone pots and wiring the bridge pickups straight to the volume knob. 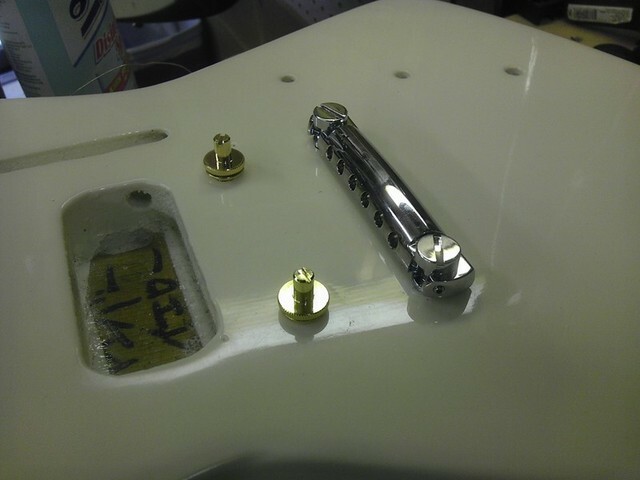 I originally upgraded the straplocks to chrome Schaller straplocks, but I ended up going back to vintage Gibson style. I now use StewMac black plastic disc straplocks on this guitar and they work great, much better than the Schaller straplocks. I saw Clapton and Doyle II using them on tour and now I use 'em on most of my electric guitars. I'll try to get a clip posted when my Rockstah Marshall is out of the shop...it sounds great and feels amazing! I have 17 guitars and this one is one of my favorites...this build took place over several years and it was worth all the time, effort and money. All told I spent about $1,100 on it...considerably less expensive than a mint example of a 1975 Ibanez Destroyer and I was able to customize it the way I wanted it down to the very last detail. It is great fun to play this guitar in clubs...no one has any idea that it is basically a total Van Halen geek guitar because the white phase of this guitar is not as well known as the "Shark"/red and white stripe phase and it is certainly not anywhere near as well known as any of the striped Frankenstein designs. Because that wasn't Ed's Destroyer. It's the one he borrowed from Chris Holmes. Last edited by Double Down; 09.25.16 at 11:13 PM. Super cool thread garbeaj! I saw an original Greco Destroyer on ebay a couple months ago for I think $750, but unfortunately I couldn't afford it. Nice job on your Destroyer! Looks awesome! You're playing , teaching , attention to detail/builds , and 'fellow guitar brother/chill' attitude is awesome !!! I'm sorry if it was confusing, but I started off the thread by giving some background about the Chris Holmes Ibanez Destroyer that was purchased at more or less the same time. They both began as stock instruments and then Ed painted his white and Chris painted his red. Eddie borrowed the red Destroyer from Chris Holmes to record Women and Children First (as Bluto said) because he felt that he ruined the tone when he turned his own Destroyer into the "Shark" and removed all the wood near the bridge. Eddie loved the sound of his original Destroyer and some of the best tracks on the first album were recorded with it, including their breakthrough single "You Really Got Me" and of course many key tracks on WACF were recorded with the near identical guitar, the Chris Holmes Destroyer. Last edited by Double Down; 09.25.16 at 11:14 PM. Wow Allan! That is some devotion right there! I agree, I think the white Destroyer looks KILLER! And yours looks even BETTER! 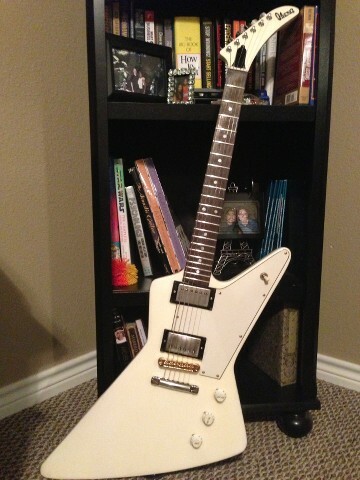 If I found one for $750, I'd be tempted to Sharkify it as it is the unicorn guitar for me. I don't know if I could do it though. Very very cool and awesome thread. Thanks very much Nick! I know you appreciate attention to detail and I'm glad you were able to see the "mate" to the excellent '78 Frankenstein that you painted for me! The Gibson scale length and the deep cutaway at the top of the fingerboard make playing difficult licks like the "spread" lick from "Take Your Whiskey Home" a breeze...I used to struggle playing that lick on my Les Paul years ago...it was virtually impossible to play it standing up! Getting an accurate replica of the guitar that Ed used on a particular recording can really open your eyes up to how Ed played certain things. The fast "spread" lick from "Take Your Whiskey Home" is one example, but there are many, many others. Yeah I got all those points, I just hadn't heard before that Ed borrowed a Destroyer for WACF. I assumed he used his anyways despite not being happy with the change in tone after cutting it up. Never realized he only used his for the WACF photo shoot. Great thread and great job on the guitar. Was expecting to see it completed with your own striped up Shark. Caught me off guard by stopping at the white! Ha.. 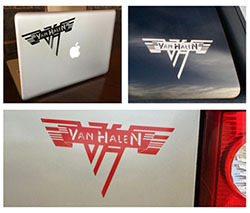 Safe to say nobody will ever pick up the fact that it's a VH replica of sorts.